A new add-on keyboard unit from Atari will turn the world's most popular video game machine into a home computer — for under $90. Atari's announcement of a plug-in computer keyboard for the VCS 2600 game machine adds yet another contender to the growing field of sub-$100 home computers. But more than that, this may well be a move to capture the huge number of VCS owners who are considered prime candidates to buy a home computer. Since 1977, when the VCS (Video Computer System) was first introduced, more than ten million have been sold — far more than any other game machine. That massive "installed base," as it's called by marketing people, represents a lucrative market for the new computer keyboard. What's more, by announcing the product so far in advance (the keyboard is not scheduled for delivery until September 1) perhaps Atari hopes that many of these ten million potential customers will put off buying a competing model in the meantime. So how will the new computer stack up against the competition? Atari's early specifications indicate it will be a solid contender, unless new computers introduced this summer by competitors radically change the under-$100 market. 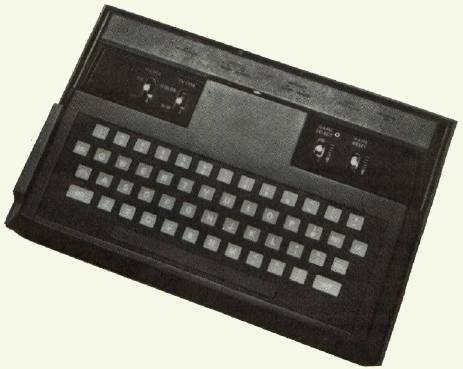 Atari's official name for the keyboard unit is "My First Computer." Expected to retail for under $90, My First Computer clamps onto the VCS piggy­back-style, plugging into the game machine's cartridge slot. No other connections are needed. The marriage is more or less permanent, since the VCS can still be used as a game machine by plugging cartridges into an expansion slot on the side of the computer. My First Computer's keyboard consists of 56 moving rubber keys, arranged typewriter-style (QWERTY). Although not quite a full-stroke typewriter keyboard, the partial-stroke rubber keys do have a better feel than the Atari 400's flat membrane keyboard. The rubber keys are very similar to those found on several other low-end home computers recently introduced (see "New Home Computers At The Winter Consumer Electronics Show," COMPUTE!, March 1983). Standard features include 8K of Random Access Memory (RAM), expandable to 32K RAM; 16K pf Read-Only Memory (ROM), which includes an 8K BASIC programming language; upper- and lowercase characters; a 16-color display, with eight luminances (shades) per color, for a total of 128 hues; screen format of 32 columns by 24 rows; maximum graphics resolution of 192 by 160 pixels (screen dots); two sound generators; a built-in interface for storing programs on any standard cassette recorder; and an expansion slot for plugging in game cartridges, memory expanders, and peripherals. The new computer's Central Processing Unit — the microprocessor chip that is the central brain of a microcomputer — is the widely used 6502. This chip is also found in Atari's existing home computers, the 400, 800, and 1200XL, as well as in some competitors. However, My First Computer will not be software or hardware compatible with Atari's other computers. The 8K BASIC in the new computer will be a cross between the existing Atari BASIC and the more generally used Microsoft BASIC. The string-handling, for example, will conform more closely to Microsoft BASIC than Atari BASIC'S nonstandard approach. Although design work on the BASIC and Operating System is not finished, one of Atari's goals is to include special statements for graphics and sound in the language, as found in Atari BASIC. Since the existing Atari peripherals will not work with My First Computer, a new line of low-cost add-ons is being planned. This will include a printer and some type of fast mass storage device, either a minifloppy disk drive or some other alternative. Atari is not ruling out the possibility of a microfloppy disk drive or a stringy floppy wafer-tape drive, because it wants to keep the cost of the peripherals comparable to the cost of the computer. Atari's current disk drive for its 400/800/ 1200XL models retails for about $500. "We don't see a lot of rationale in offering a $500 add-on for a base unit that will sell for under $90," says Bill Simmeth, project manager for My First Computer. "Some other types of technologies look attractive to us." Simmeth said it is still too early to say if My First Computer will have advanced graphics capabilities such as programmable characters and player/missile graphics (sprites). But he did say that it will have several graphics modes, that more than two voices will be possible through programming, and that the VCS's chips will be handling some graphics processing to relieve the 6502's workload. "It will be like a dual-processing system, similar to the [existing Atari] computers, although not exactly alike. People will not be buying just a toy. They're buying quite a nice, and a quite comparable, real computer." Atari plans to introduce about 20 cartridges for My First Computer when it is delivered, including a new line of enhanced games and home application programs. Software may also be sold on cassettes. Interestingly, Atari says it does not consider its main competition for the new computer to be the similar add-on keyboards for competing game machines, the $150 Mattel Intellivision and $170 Colecovision attachments. Instead, Atari is aiming its new model at home computers such as the $99 Timex/Sinclair, the new $99 Texas Instruments TI-99/2, and the Commodore VIC-20, which may drop below $100 by the time My First Computer is ready. To complicate this low-end market still further, later this year Atari may introduce a keyboard attachment for its newer, more advanced game machine, the 5200. However, no details of this project are being released. Atari also says My First Computer will not compete with its own Atari 400, which is selling for less than $200. "My First Computer is the missing link between video games and computers," says Michelle Simpson, an Atari spokesperson. "We don't see it as competing with our own computers. We see them as different models, like the different models produced by a car company."